Chalk up another impressive win for the KCA Bridge Inspection Team! 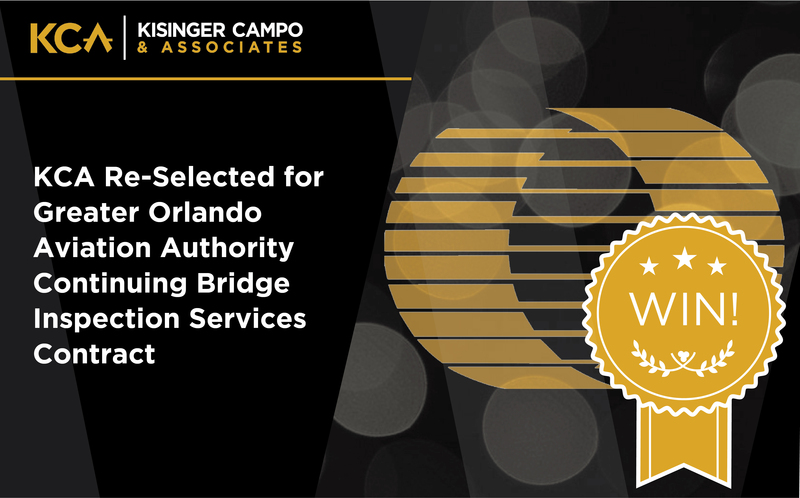 KCA was notified on February 13 it was re-selected for the Continuing Bridge Inspection Services Contract (W-00398) by the Greater Orlando Aviation Authority (GOAA). For this successful pursuit, KCA teamed with subconsultants Bolt Underwater Services, Inc. and OM Engineering, Inc. This five-year contract calls for KCA to perform bridge inspections and related professional services, including but not limited to, conducting biennial or periodic inspections for bridges, roadway sign structures, high mast light poles, and water structures such as box culverts and pipes; update the current inspection reports; and perform all other related services including coordination with GOAA, its Consultants, the City of Orlando, and all involved agencies at Orlando International Airport, Orlando Executive Airport, and other facilities operated by GOAA. KCA was originally selected for this GOAA contract in 2014. The high quality of inspection work and emergency response provided by the KCA bridge inspection teams was instrumental in this win! Congratulations to the pursuit team including Patrick O’Grady, Ken Reinhold, Edward Burkett, Scott Betz, Jim Kelley, Ken Renfro, and Joseph DeYoung. A big thanks to all that helped with the preparation of this letter of interest, technical proposal, and the marketing efforts that contributed to this win!